Vacheron Constantin boasts a long history of producing calendar watches. Its first identified complicated timepiece is a full calendar from 1790, and the manufacture subsequently made unique pieces during the following centuries. 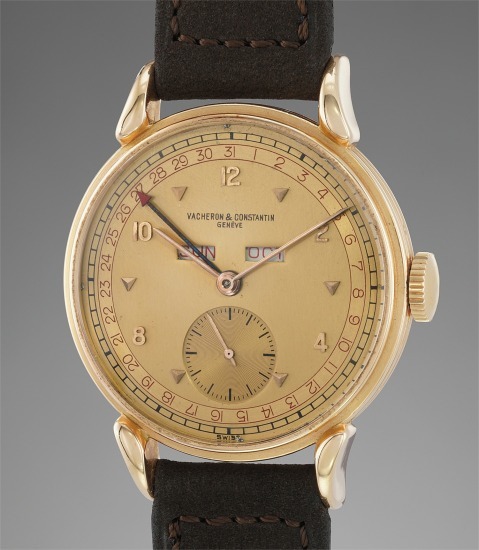 However, it was not until the launch of reference 4240 in 1942 that this complication entered the brand’s catalogue as a serially produced reference. It was produced both with and without moonphases, the former indicated by ‘L’ for ‘lune’ after the reference number, and the latter indicated by the present example. Additionally, Vacheron produced examples with the days printed in both red and blue, a feature they offer on the modern reinterpretation of this vintage wristwatch, the Vacheron Constantin Historiques Triple Calendrier 1948. The day and month are indicated via two apertures on the top part of the dial, whereas the date is indicated by a central hand against a beautiful and warm two-tone champagne dial. Small Arabic numerals interspersed with pyramidal indexes demonstrate the hours, while a printed railway track indicates the minutes. The result, displayed on a resplendent pink gold dial and housed in an architecturally elaborate matching pink gold case, is truly harmonious. The elegant pink gold fluted case is associated with lugs that look slightly tapered when viewed from the top but are aggressively downturned, looking like fangs, when seen from the side. The aesthetics of the present timepiece are matched only by its overall impeccable condition.